Goldfish are in the columnea family and come from the tropical areas of Central and South America. 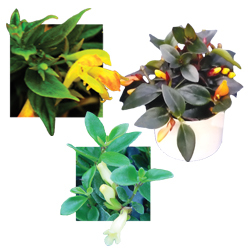 This vining plant has unusually-shaped blooms in reds, yellows, and oranges that make for a lovely hanging basket. Goldfish have a reputation for being fussy plants, but a little care to give them enough indirect light and not too much water goes a long way to help these exotic plants thrive. For best results with Goldfish, we recommend using a balanced fertilizer on a constant feed program of 150 ppm N. Maintain a pH between 5.5 - 6.5. Be careful not to over-water or these plants will succumb to root rot. We recommend that you pinch Goldfish Hybrid Assorted 5-10 days after transplanting to your final container. Additional pinching may be necessary for the final shape of the pot. Goldfish should be spaced adequately to allow airflow and light penetration between the foliage. Usually 2’ centers on baskets will be enough. We do not recommend plant growth regulators for Goldfish. Control growth through proper pinching. Aphids, mealybugs, and thrips are the primary pests attracted to Goldfish. Goldfish Hybrid Assorted are subject to root rot. Use a well-drained soil and avoid over-watering. Water in the morning to allow plants all day to dry out before the cool of evening returns. We recommend planting 5 starter plants per 10 inch basket. Use a well-drained soil in your baskets and plant your starter plants deep, allowing the ellepot to be completely covered by the soil. If you are planting 4” pots, 3 plants per pot should be sufficient. Plant them in a triangle in the middle of your pot. Pinch Goldfish Hybrid Assorted 5-10 days after transplanting to your final container. Additional pinches may be required to shape your final pot.